Each Winter, I go on a hunt for the ultimate cozy sweater. Criteria: over-sized, super soft and luxurious. I don’t mind a bit of a splurge if it’s a classic piece. I went to all the usual suspects when looking for my new cozy piece, but ultimately fell in love with everything about this buttery cashmere piece from All Saints. It’s a fantastic neutral, uber soft and really has endless styling possibilities-which I always love in any piece of clothing. Sweater: All Saints (also love this one), Leather leggings: Alice + Olivia (similar here & love this faux version), Bag: Celine (similar color here), Shoes: Christian Louboutin, Sunnies: Ray-Ban, Nails: Essie in Poor lil rich girl. 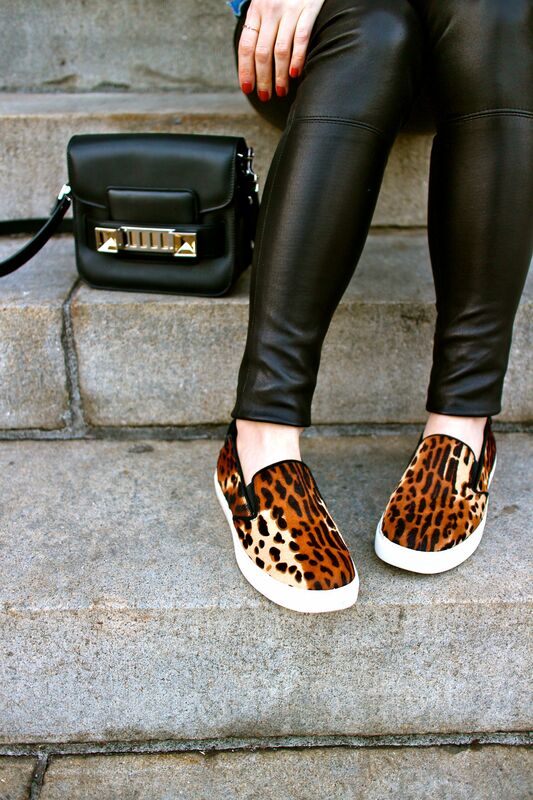 I’ve always been a sucker for anything leopard and with the current influx of animal print accessories, I’ve been in heaven. I fell hard for these Kenneth Cole sneaks, especially for city life. I can’t wait to pair them with some distressed cutoffs in the Spring (please hurry back warmth), but for now, leather leggings are my go to partner in crime for my favorite print. 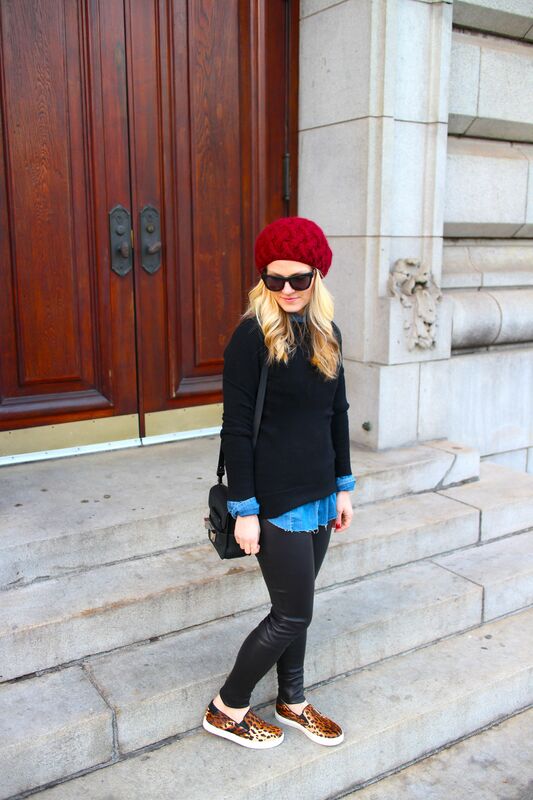 Leather leggings: Alice + Olivia (also love these (ON SALE!) 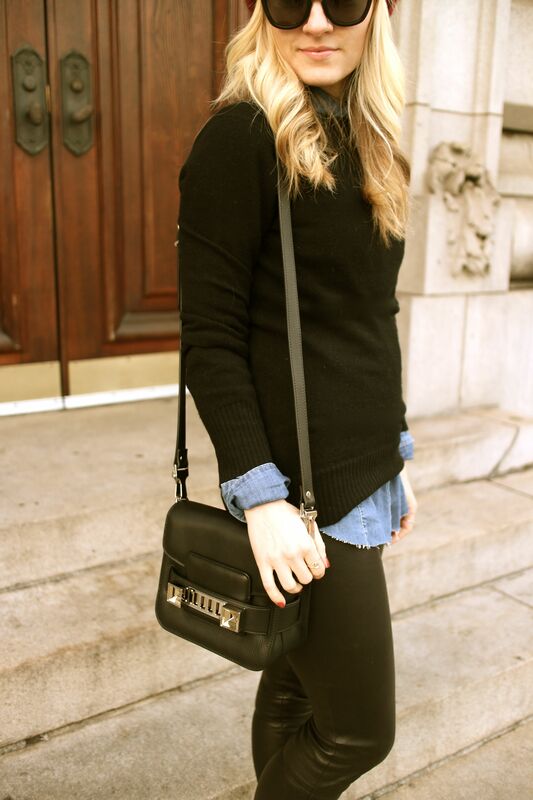 and this vegan version), Chambray top: Blank NYC (similar here & here), Shoes: Kenneth Cole (similar here & here), Sweater: Hayden (similar here), Hat: Eugenia Kim (similar here & here), Bag: Proenza Schouler, Sunnies: Westward Leaning, Ring: Loren Stewart. I am having a major leather crush at the moment. Having come from Sydney, it really was never cold enough to have an abundance of pieces, but with NYC still smack dab in the middle of frigid weather, my leather collection is front and center. I had been on the hunt for the perfect leather skirt for quite some time now and felt butterflies when I came across this one. It ticked all the boxes and bonus, it can be worn many different ways. Zippers have become the new “it” detail on everything from denim to leather. My leather pencil can have a side zip, back zip or front zip. 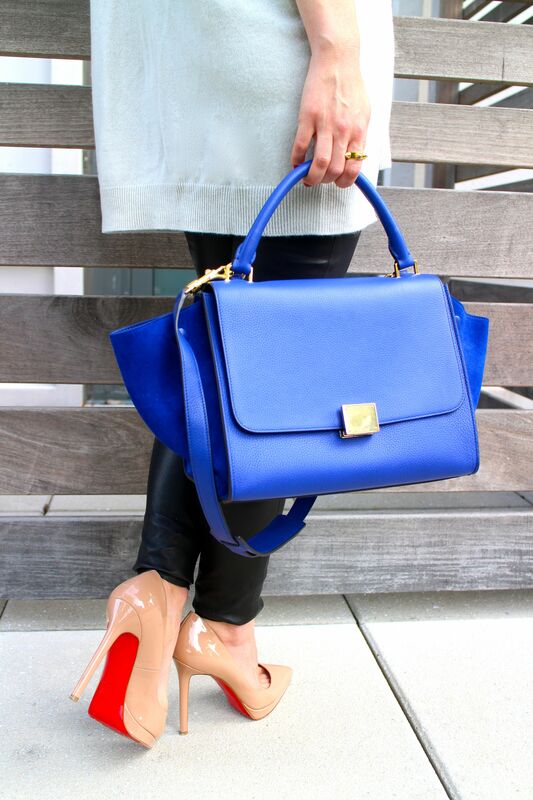 Perfection for a fabulous staple with a multitude of options. 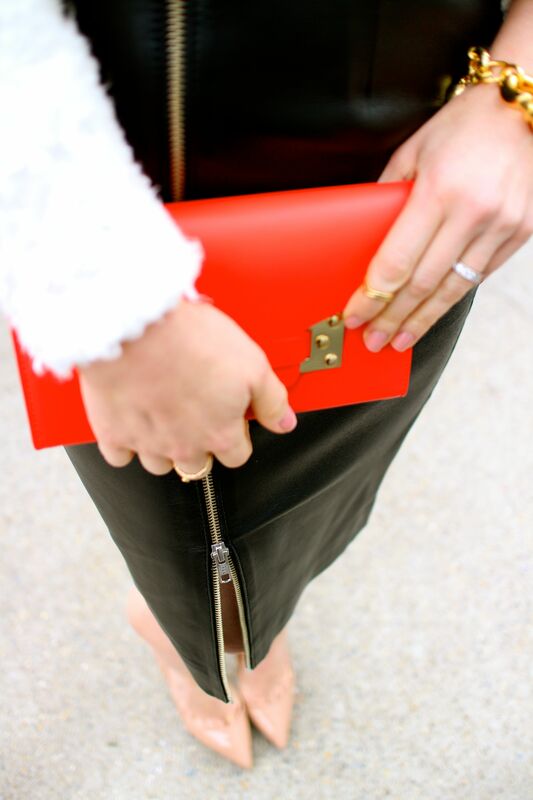 Leather skirt: Nicholas (also love this one. Vegan version here ), Clutch: Sophie Hulme (in black here, also love this one), Sweater: Rag & Bone (similar here & here), Sunnies: Karen Walker (also here), Shoes: Christian Louboutin, Bracelet: J. Crew, Lips: Makeup Forever.